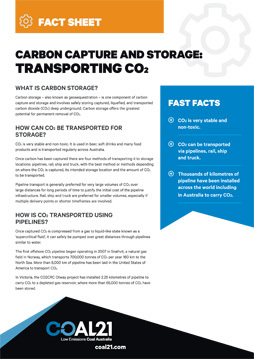 How can CO2 be transported for storage? CO2 is very stable and non-toxic. It is used in beer, soft drinks and many food products and is transported regularly across Australia. Once carbon has been captured there are four methods of transporting it to storage locations: pipelines, rail, ship and truck, with the best method or methods depending on where the CO2 is captured, its intended storage location and the amount of CO2 to be transported. Pipeline transport is generally preferred for very large volumes of CO2 over large distances for long periods of time to justify the initial cost of the pipeline infrastructure. Rail, ship and truck are preferred for smaller volumes, especially if multiple delivery points or shorter time frames are involved. How is CO2 transported using pipelines? Once captured CO2 is compressed from a gas to liquid-like state known as a ‘supercritical fluid’, it can safely be pumped over great distances through pipelines similar to water. The first offshore CO2 pipeline began operating in 2007 in Snøhvit, a natural gas field in Norway, which transports 700,000 tonnes of CO2 per year 160 km to the North Sea. More than 6,000 km of pipeline has been laid in the United States of America to transport CO2. In Victoria, the CO2CRC Otway project has installed 2.25 kilometres of pipeline to carry CO2 to a depleted gas reservoir, where more than 65,000 tonnes of CO2 have been stored. How is CO2 transported using trucks? The transportation of gases such as CO2 by truck to enable its use in beer, soft drinks and many food products is widespread around the world and in Australia. Liquefied CO2 can be carried in tanks on specially adapted trucks. How is CO2 transported using ships? The transportation of CO2 by ship is common in Europe, with four pressurised CO2 carriers transporting CO2 for use in food products. The liquefied CO2 is carried in specially adapted tanks in the same way as trucks and trains. How is CO2 transported using rail? Railroad transport of CO2 in specially adapted tanks is a viable option if the existing rail infrastructure links the capture plant with the storage destination. It is a better option than trucks if there are large amounts of CO2 being transported. How is CO2 transported in Australia? In Australia, CO2 is most commonly transported by truck with small volumes delivered to multiple industrial users. The Callide Oxyfuel Project, supported by COAL21, transported a small volume of CO2 by truck from Queensland to Victoria for test purposes at the CO2CRC Otway site. Other COAL21 projects plan to use trucking for small volume, short duration demonstration stages. 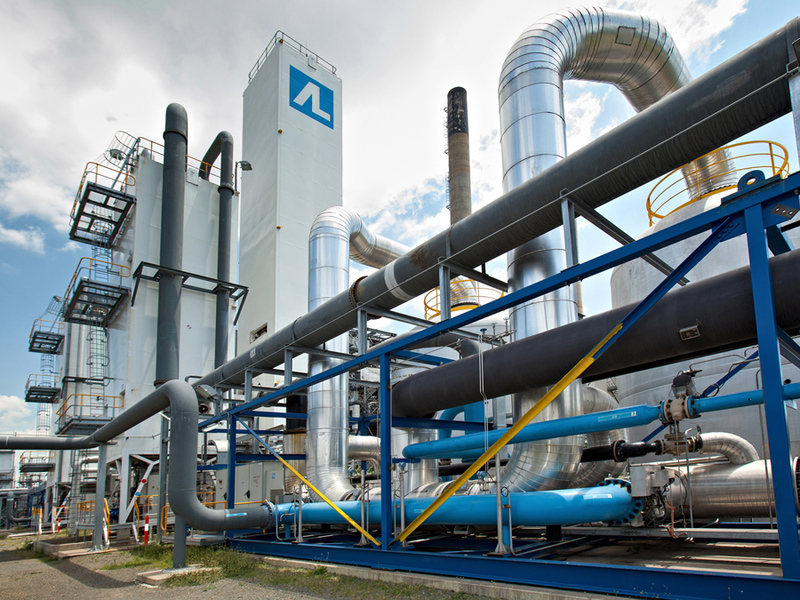 However, when CCS is deployed commercially in the longer term pipeline transport will be the preferred option. CO2 is very stable and non-toxic. CO2 can be transported via pipelines, rail, ship and truck. Thousands of kilometres of pipeline have been installed across the world including in Australia to carry CO2.